Great info on Tesla's current vehicle features, desired features, books, links, undocumented and modifications! 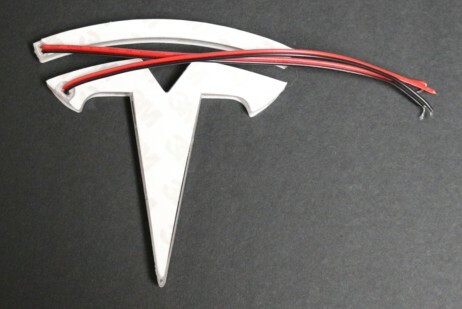 This project illuminates the Tesla “T” emblem on the front nose cone of the classic Model S with a cool glow behind the chrome logo. It’s production quality that will look like something that might have come from the factory. This does not work for the refreshed Model S or the Model X. See our Tshow project for lighting the front of the refreshed Model S as an more advanced alternative (with videos). As with all our projects, we do not believe any of these changes will affect your warranty. At the same time we’re also not going to take any responsibility should this not be the case and/or you screw up and damage your car! If you’re comfortable working on cars and basic electrical work, this should be an easy project. We suggest you read through the entire project to be sure you have everything you need and feel comfortable with this project. 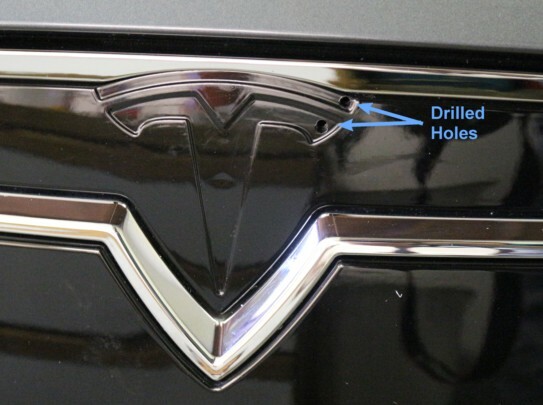 In addition there are alternative instructions at Teslarati.com. There are a number of ways to install and control the Lighted T, so we’ll show you some of those options. Specifically, we wanted our “T” to remain lighted all the time, but at a reduced brightness such that it would have minimal battery drain. When the headlights are on, it jumps to full brightness. First we want to make sure you have a nose cone that is compatible with the Lighted T. Most (perhaps all) cars built in January 2013 or later uses a newer, slightly flatter, one-piece nose cone. Cars built in the first six months of production, mostly 2012 signature edition cars, use a two-piece nose cone that protrudes slightly more than the newer design. If you have one of the older style nose cones, it cannot be used for this project as the curve where you mount the T is different. You can replace the nose cone with the newer style, but the cost from Tesla is around $450. The Lighted T version 1 was created in clear plastic. This produces the brightest light, but you see the individual LEDs. Version 2 is now available and uses diffused plastic. If you get version 2 (from the link above), you can skip this step. I elected to first sand all the clear surfaces of the two Lighted T parts to add a bit of diffusion. I sanded the exposed surfaces by hand with 320 grit sandpaper. This took about 20-30 minutes. It’s fine to skip this step as it doesn’t affect functionality. Even with sanding you can still see the individual LEDs when lit, but I do think it looks better. With the nose cone still attached to the car, use a few feet of the dental floss, and slide the floss under the top emblem part. Sliding the floss back and forth, cut through the foam adhesive holding the emblem to the nose cone and remove the part. Do the same for the lower emblem part. Remove as much of the black foam adhesive from the chrome parts and from the nose cone. On the T parts, I suggest placing them on a soft cloth or perhaps using painters tape on the front surface to prevent scratches. I used semi-hard plastic flat tool to scrape off the black adhesive foam. Don’t use a metal tool or you could scratch the surface. Next, use some Goo-Off to remove the remaining residue. This may take a bit of patience, as the adhesive doesn’t come off easily. Once all the goo is removed, clean the area with rubbing alcohol to remove the goo-off residue. This will make a stronger bond when attached in the next step. With the Lighted T arc (top part), notice how the wires stick out from the back. A hole is needed in the nose cone right side so the arc can be powered up. Similar, the lower Lighted T part also requires a hole. Estimate where the wires should go with a dry fit (do not pull the adhesive off yet), and use the nail set to mark the center. Drill two holes for the wires. I stared with a 1/32” bit first to make a pilot hole, and followed it up with the 3/16” bit. After you go through the black plastic nose cone, there a silver plastic part behind it. Drill through this as well. This will help with the dry fit, but the silver plastic holes will not be used in the final assembly. Clean off the remnants from making the hole. Dry fit each part by pushing the wires in to the hole. If the part doesn’t fit as you like, remove the parts and make the hole(s) a bit larger to get the positioning where you want it. It took me a few tries to get them aligned the way I wanted. With the fit looking good, clean any remaining tailings from drilling operation. Remove the backing from the top Lighted T arc and after feeding the wires into the hole, press into place. Remove the top backing and press the chrome emblem arc on top. Repeat for the lower “T”. There are at least four ways to wire your lighted T.
1) Really easy: Hard wire it to the Daytime Running Lights (if your car has DRLs). 2) Really easy: Hard wire it to the Headlights, so the T only comes on when the headlights are on. You can turn the Lighted T on or off, dim, flash and other effects. While the controller appears to work well, reports have indicated the remotes poorly built and have a high-failure rate. For that reason, we elected not to use this method. 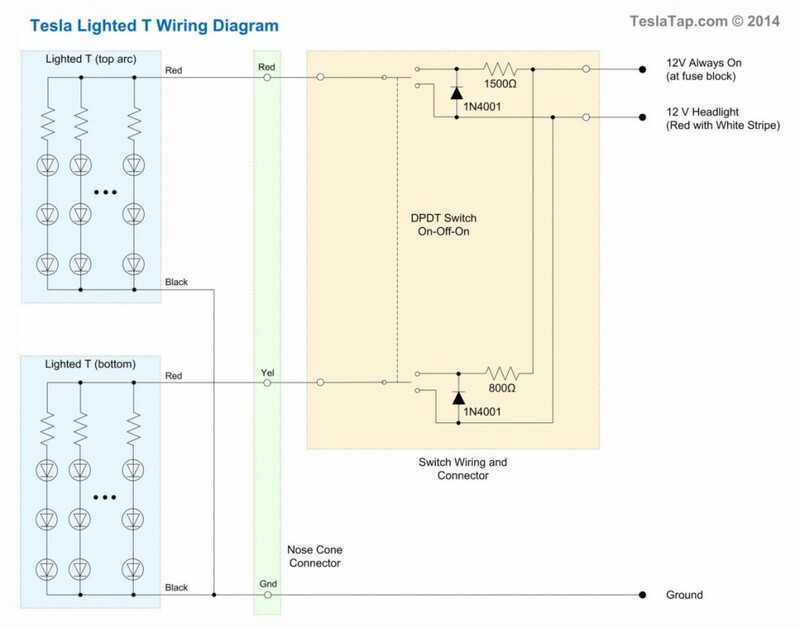 See the alternate instructions at Teslarati.com if you want to try this method. We used option 3 with it wired to the headlights. It does require a few more parts and some soldering. While the first two options are far simpler to wire up, I wanted to have the T lit up all the time. Our approach only takes about 5 mA in always-on mode. Even if the 12 V battery was never charged from the main pack, this current draw would take over a half a year before draining the 12 V battery! Other items in the car consume far more power, even in the car’s power down mode. Another choice with option 3 is where to put the switch. We deiced to install in the frunk. We don’t anticipate change the switch position often, but felt it should at least have an off option. It could be installed in the cabin, but it’s hard to find a good place to mount it. I felt getting the wires from the frunk to the cabin is more difficult than it’s worth. Remove nose cone, by inserting a plastic tool to release the lower five clips. Pull outwards from the bottom and all the top snaps will release. If you have parking sensors, disconnect the wires so the nosecone is fully removed. DO NOT place the front of the nose cone unprotected on the floor or it will get scratched! Use a carpet scrap or just hold it carefully until removed. Move it to a higher surface such as a table – preferably covered with a soft towel to prevent scratches. Take the two-wire power extension and cut the wire 24″ from the male connector end. Connect the male side to the two LEDs you mounted in the nose cone. Attach the two red LED wires to the black with white stripe. Connect the two black LED wires to the black wire. Take one of the 4 pin extension cords and cut the wire 24” from the male connector end. Connect this portion to the 4 LED wires. I connected the red wire from the arc T (top) to the red wire. Connect the red wire from the lower T to the yellow wire. Connect the remaining two black wires from together and to the cable’s copper shield. I cut off the white wire, as it will not be needed. I used shrink wrap on each connection and a larger shrink wrap tubing on the entire connection. Route the wires as shown. 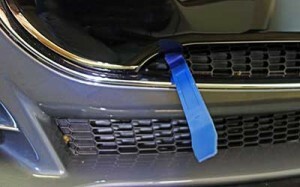 Attach a tie wrap holder after cleaning the area below it. Add a small tie wrap to hold the cable and prevent pulling out the wires from the LEDs. Put the nose cone aside for now. This optional switch can be wired many ways depending on your preference, or you can even elect to hard wire it without a switch at all. Update: I never use the switch, so you may want to skip the switch and save some installation time. See the second diagram. For the switch, we elected to have a second connector on this assembly to make it easier to work on, and allow easy disconnection if Tesla service needs to pull the Frunk tub liner. While I used a 6 pin connector I had laying around, any 4-pin connector rated for vehicle use should work fine. The currents are quite low, so nothing heavy duty is needed. Attach the two diodes, two resistors and the wires from the connector to the switch using the schematic diagram. With the frunk open, remove the carpet. Locate the frunk release button near the frunk LED. To the passenger side of the button drill a centered 1/4 “ hole for the switch (it’s easier to do this while in place). Pull the plastic assembly upwards that holds the frunk light and yellow release button. There are two black clips at the very top that hold it in place. It requires a bit of force to release these clips. Disconnect the light and button connectors and put the panel aside. Don’t lose the two black plastic clips at the top! We’ll call the plastic box behind the panel the frunk latch box. On the frunk latch box, drill a hole through the bottom on the driver’s side for the wires. It already has one hole in the center, likely a weep hole should any water collect. Don’t use the existing hole. The 4-pin connector cable and two additional wires will be routed through this hole. It’s a bit tricky to hook the wires up through the hole. First I got about 3 ft of 20 AWG solid wire to pull the other wires through the hole. Any scrap of solid wire will do. With the 4-pin female connector (that mates with the connector on the nose cone) wire end, I soldered the ground to the 20 AWG wire so that it will pull through the hole. Take a large paperclip and bend it to have a small loop on one end (small enough to go through the hole). I poked this through the hole and angled it towards the driver’s side headlight. I then feed the loose end of the 20 AWG wire through the loop and pulled it back through the hole, and pulled along the 4-wire cable through the hole. Cut off the 20 AWG portion and discard. From the inside of the frunk feed two wires (one red, one white) out the same hole. The red wire goes to the fuse (about 8 ft) and the white wire goes to the headlight (about 4 ft). We’ll connect these up later. In the frunk latch box I connected a 6” ground wire (black) to the ground of the 4-wire cord. From the 4-wire cord, the red and yellow wires are wired to the switch assembly connector. The single white and red wires are also connected to the switch assembly connector. These will match up to the related connector pins on the switch. Locate the connector that goes to the frunk LED. We’ll use the ground connection (black wire). Using a solderless connector, attach our black ground wire to the LED black wire. Be sure to leave an inch between the Solderless connector and the LED connector so it fits the LED assembly. Remove the plastic cover between the frunk and the windshield. It lifts from the windshield side, and slides towards the windshield. It’s a bit of a tight fit. Holding the driver’s side cover is a 2” rubber pad. It unscrews counter-clockwise. Once it is pulled out, the cover lifts out with a few snaps. Locate the wires coming from the driver’s side headlight. Unwrap a portion of the electrical tape so you can locate a specific wire. Use the Red with white stripe (old harness) or Blue and red stripe (new harness) for powering the T when the headlight is on. Use the Orange with black stripe (old harness) or Orange with green stripe (new harness) to power the T when the Daytime Running Lights are on (if your car is equipped with DRL). Don’t confuse a red with gray strip wire for the desired red with white stripe wire, they look similar. Connect the black with white strip wire from the female connector to the desired headlamp wire. Connect the black female connector wire to a ground. You might use a crimped or soldered grounding lug on this wire. Mount the lug on a nearby bolt that is grounded. With the desired wire, use a solderless connection to the white wire coming from the latch box. Connect the white wire to the desired headlamp wire. Route the red wire around the frunk hub to the fuse panel. Be sure to position it under the cover clips so that it will not be pinched when you later put the covers back in place. I used some more adhesive squares with tie wraps to keep the wire neat and out of the way. 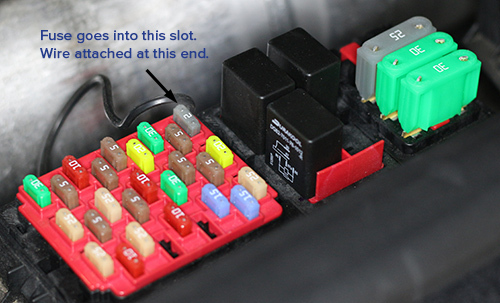 At the passenger side fuse box, open the cover by pressing on the two side latches. I took a gray 2 amp fuse and soldered the red wire to one side of the fuse. See the image of where to stick the fuse for continuous power. This previously unused slot has no actual connector on the windshield side of this slot, so the extra width of the wire is not a problem. The soldered side of the fuse must go towards the windshield. I filed a slot in the side of the cover near this fuse so the wire would not be pinched when the cover is closed. As an alternative to soldering a wire to the fuse, you could use a product like Add-A-Fuse, although there may not be enough clearance to make it work. Connect the nose cone LED connector to its mate. You should have enough wire to leave the nose cone on the ground facing so you can see the T.
Turn on the headlight or DRL (depending on what you connected) and confirm the Lighted T lights up. Connect the switch connector to its mate in the frunk latch box area. If the switch is in the center – off position, it should be dark. Toggle the switch on. One of the two on positions should light up, but dim. Now go inside the car’s Control Panel and set the Headlights on. Check that the T is now lights brightly. If there is a problem, recheck the wiring and/or use a meter to find the problem. On the top of the front steel bumper, I added one more adhesive pad and tie wrap near the red power post to hold the female connector from rattling around. 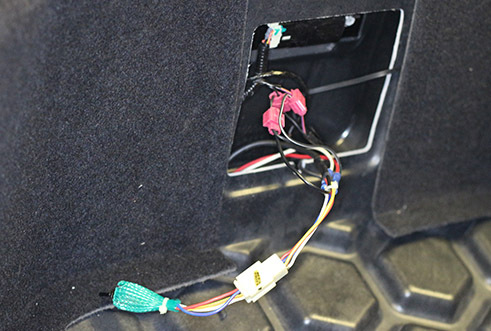 Reconnect the parking sensors (if equipped) and adjust any wires to avoid pinching and snap the nose cone back into place. Reassembly the two cover panels and screw the rubber bumper back into place. On the loose frunk panel (with the LED and release button) fit the switch in the hole and tighten the nut. Be sure to use the included lock washer so it doesn’t come loose. Fit the wires into the frunk latch box and reassemble the frunk panel so it slides down and into place. Secure the top two snaps. Reconfirm it’s still working as expected. Enjoy! A big thanks goes to the Lighted T designer, Rick Hesel. I’m impressed with the quality, and it’s cost is quite reasonable considering the very low volume (less than 200 at this writing). I guess that also makes it very exclusive! Hooked up the T with the headlight option but I am thinking I would like it illuminated with the running lights as well (+ In line resistor)can I tap into the driving light harness as opposed to running to the fuse box. If so do you know the color code wire for the running lights? Here’s the wires (as described in my article): Use the Red with white stripe (old harness) or Blue and red stripe (new harness) for powering the T when the headlight is on. Use the Orange with black stripe (old harness) or Orange with green stripe (new harness) to power the T when the Daytime Running Lights are on. Since I believe the DRL are always on when the headlights are on, but I haven’t’ verified this. If so, just use the DRL wires – no need to use both DRL and headlight wires. I installed the T using the headlight option but was thinking I might change it to “on with the Driving Lights” (with resistor) and full on with the headlights. Can I just tap into the driving light harness and the head light harness with the resistor in line on the driving light wire instead of running to the fuse box? No problem. You can connect the “fuse” box connection instead to the headlight power so it comes on at full brightness with the headlights are on. 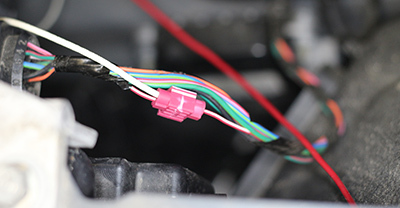 The wiring harnesses has changed over the years, so you’ll have to locate the right wire for your car. Fortunately, you can get fairly easy access to the headlight assembly wires to find the right one. The only question I have now is the wire to to the fuse box (always on) doesn’t seem to turn off at all when I was installing it so I disconnected it but dose it turn off after a few? Thanks – I’ve updated the instructions with the new wire colors for new harnesses. The whole idea of going to the fuse box is to keep it on at all times, so it never turns off. The low power dim mode will not affect range at all, even if you left it on for months. If you want it to turn off when the car turns off, use fuse position F33 instead. Thanks for sending the photo. I examined your image and took a look at my car’s wiring. The top connector is the headlight connector. 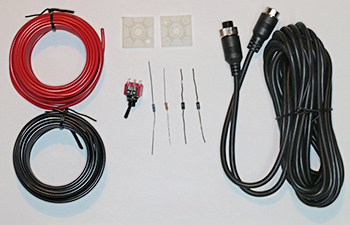 On my car, the Red with White wire goes into the connector pin 3 (which is directly below the wire that is marked “4” on the black plastic connector). On your connector, the wire looks like it is white with blue stripe (or blue with white stripe). It’s a bit hard to tell from your photo. Try that wire and let me know if it works. Also let me know the correct stripe color on this wire. Hi Folks: I’m new in this forum, but would love to have the lighted “T” installed on my MS when I get it on 9/29. The problem is I cannot install it myself as I just don’t know how nor have the ability. Does anyone know of a speciality shop or someone or place who can install these for a fee. Prefer they be in Southeastern Michigan or the Columbus OH areas but “have Model S might travel”. I hope someone does because I would love to have this!! Were these choose because the look better then full on? No problem not using the resistors. You’ll then get full brightness all the time (and there is then no need for the headlight connection nor the two diodes). Since I have the “T” on all the time, full brightness will consume about twenty times the power, although this is still not a huge amount. Being that I have never seen one live only in pics and all the other websites don’t use diodes (the easy way out is not always the best) I am not trying to pimp out my MS I want my lighted T to look like a Tesla option (thought out) not just a white dot at night or bright during to the day just to be bright. I guess my question is in your opinion are the diodes the correct option for proper light to effect ratio..
At any brightness it’s not that noticeable in daytime so it really doesn’t matter then. At night full brightness is really bright. This make sense when the headlights are on. The main reason for the “dim” mode (which is still quite bright), was when the car is parked at night – you still see the logo. At full brightness, I felt it was way too bright, and I also didn’t want to draw too much power (although this is really secondary). I’d suggest trying it, and if you don’t like it, just remove the resistors. 820 or 840 ohms is fine. I’m sure you will not be able to see the difference as this value is not critical. It’s possible Tesla has changed the color code on the wires. My car was built in Jan-2013, and they did start to use a new harness in Aug-2013. That said, it seems others have found the same wire I have. There are quite a few wires in that bundle, so you might re-check to see if you can find a red wire with a white stripe. © 2012-2019 FAQware. All Rights Reserved. 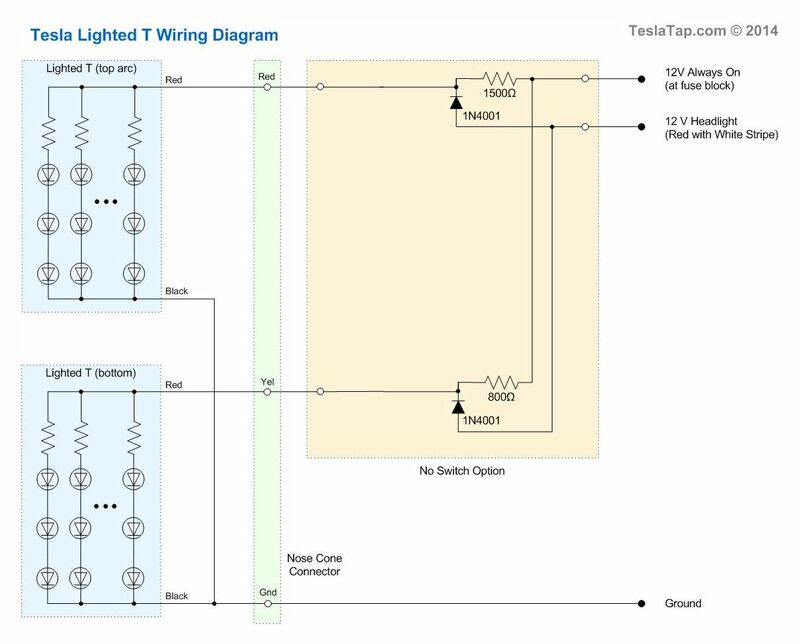 TeslaTap is not affiliated with Tesla, Inc. or its subsidiaries. 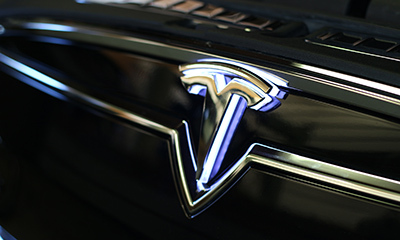 The TESLA, MODEL S, MODEL X and MODEL 3 marks are registered trademarks owned by Tesla, Inc.